Valentine's Day Morning - Super Inky! After days and days of waiting, it was finally February 14th. I was asleep in my bed, unaware that my mom had come in during the night and put out Valentine baskets. 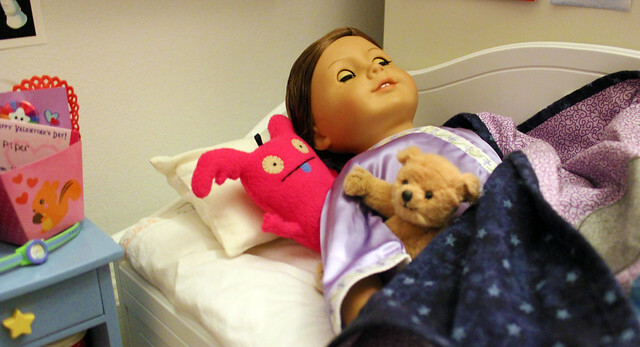 Piper was asleep too, dreaming about teddy bears and balloons. 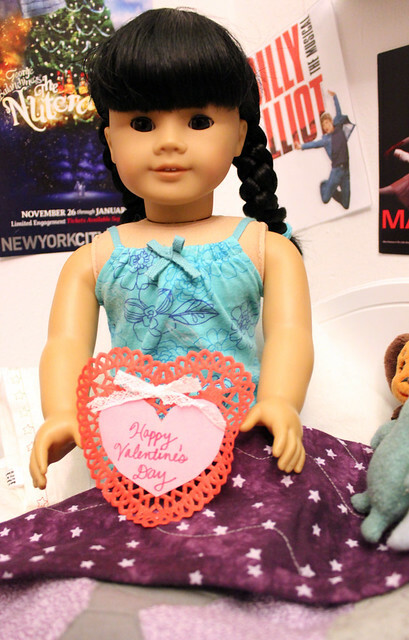 I rolled over and slowly opened my eyes- I saw the valentines! I had a little robot basket and a stuffed red panda. I sat straight up and cried "Piper! Wake up! It's Valentine's Day! We have valentines!" Piper popped up and exclaimed "Yay! I've been waiting all night for Valentine's Day!" 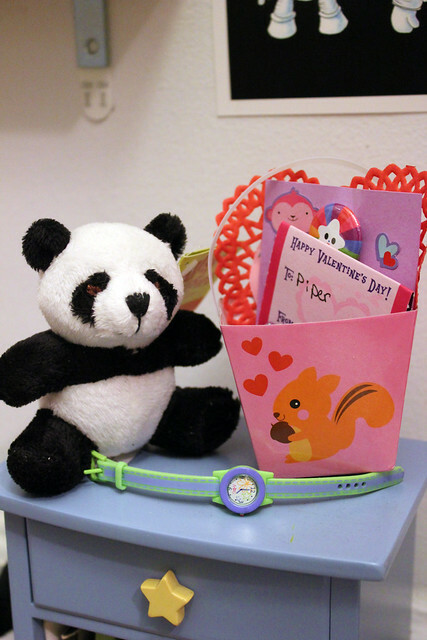 On Piper's nightstand, there was a squirrel basket of valentines and a stuffed Giant Panda. 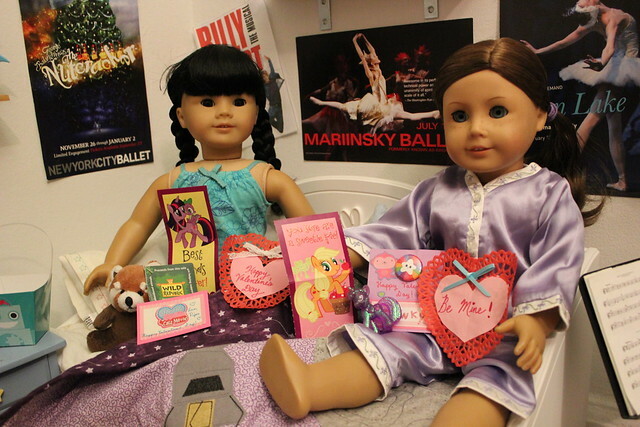 "I got a valentine from Sophie too! How sweet of her!" said Piper. "My Little Pony? Girly city! This one must be from Katia, my friend in Ohio." "My Little Ponies are awesome! They're for everyone, not just girls! 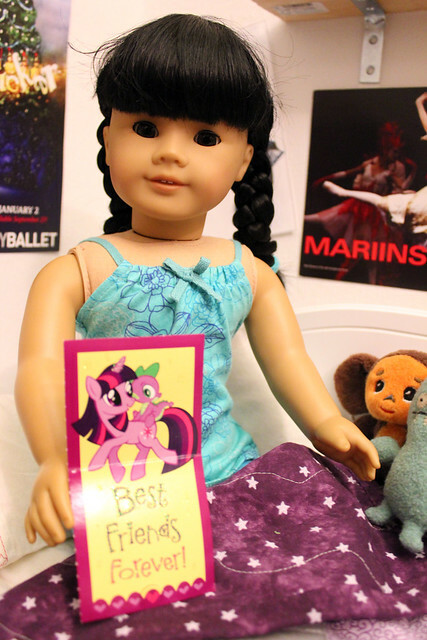 Look, Katia even sent me my own purple, sparkly pony! She's such a sweet girl." Piper loved her new little purple friend. "Piper! You're so silly. You didn't have to give me a valentine!" We had made valentines the weekend before. Of course, we each saved a valentine for the other. "And this stuffed red panda is so cute! That must be what you bought me at the National Zoo gift shop!" "Yup!" said Piper. "And you got me a Giant Panda! We're going to have to invest in bamboo- our pandas will keep us busy! Thank you for the cute valentine Inky, I really like the star pin." Piper and Inky piled all our valentines onto my bed and admired them. Thank you to all our friends who so kindly sent valentines! P.S. If you requested a valentine from me, they'll be in the mail very soon! I'm glad to see you received my valentines! Thank you very much for the one you sent me as well. I love it and the little UglyDoll pin, too! Cute, cute stuffies! I love that red panda. Hi!! Where do you get those mini books and posters? I love your valentines, I want one!!! The pins are so cute! 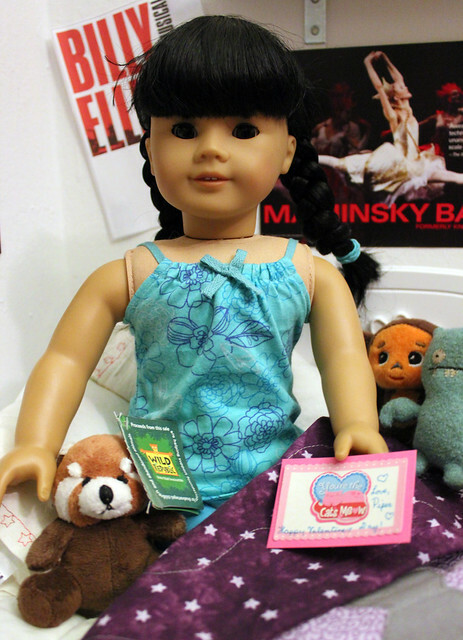 Anonymous, I got the mini books from American Girl's mini dolls. Each mini doll comes with a mini book. I do have some leftover valentines- if you'd like one, just email me at inkymarina@gmail.com with an address. Ask your parent first though! 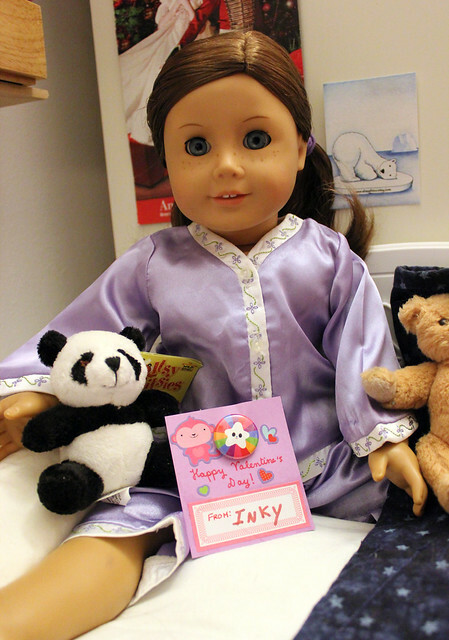 Wow, Inky, you got some fabulous Valentines! Happy Valentine's Day to you and Piper! Inky, you got a new bed ;) It looks really good. Do you still have the other ones? they were cute. Glad you liked your Valentines! 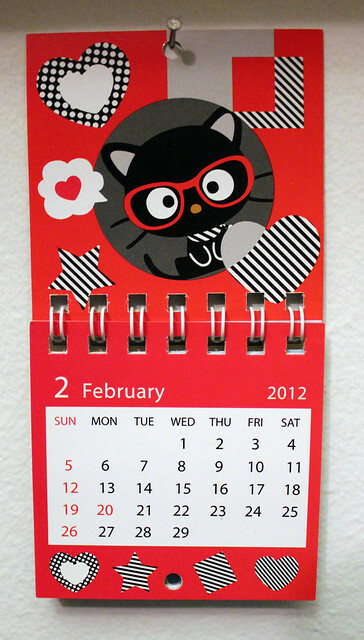 I love your Chococat calendar, Inky! My sister, Mei, says she wants one too! I also love the ballet posters since I do ballet. How did you get those? And how to you make those shirts with the printed image on them?? Hi Inky! It looks like you had a great Valentines Day! I did too! By the way, would you mind joining my blog? My ballet posters are promotional postcards I get in the mail from different ballet companies. Usually if you attend several performances, they put you on their mailing lists and you get lots of goodies in the mail! Cool thanks! You are so awesome! I always look forward to reading your blog! Sorry about all the questions, but you have a lot of cool stuff and ideas. SO do you have any ideas for me to use for Easter baskets for my 2 dolls?? Like where would I find mini baskets and things to put inside? Those Valentines are adorable! Do you know where Katia got you the Purple Twilight Sparkle from? 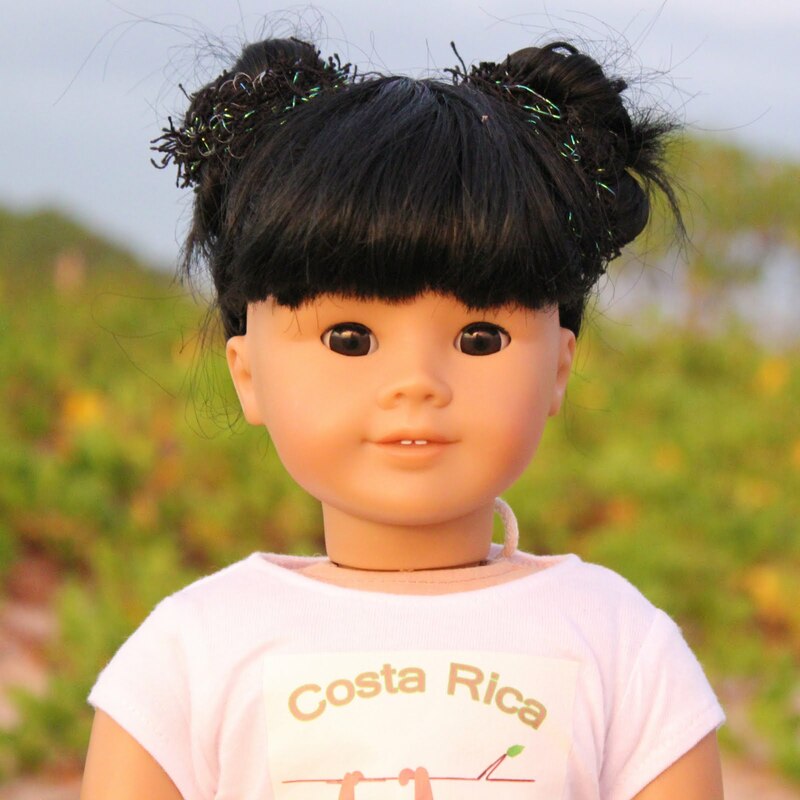 Hi Mel, I do have ideas for Easter items for dolls. I'm going to be doing a post about it soon, so keep an eye out! Vivy, the Purple Twilight Sparkle is from a blind bag that Katia's mom bought at WalMart. If you look at the little code on the bag, I believe that one is #24. I'll be looking forward to your post! This is kind of off topic but where would you find doll sized leotards in different colors, like green and purple? I get my leotards custom-made for me by a friend. I do know you can get leotards in many colors on etsy though! Thanks for the tip! Do you think I could find corduroy pants on etsy too? Sorry I have so many questions! Very cute! My dad wants a stuffed red panda like yours now. I think you could find corduroy pants pretty easily. I got my camel colored ones are from Liberty Jane, but my darker, chocolate brown ones are from Angel Kisses Boutique on etsy. You might want to visit her shop and ask if she'll make you a pair. Cool thanks! Are you going to post soon? I miss reading them!! Oh and by the way I absolutely love your polichinelle costume, this year in my Nutcracker I was also a polichinelle! 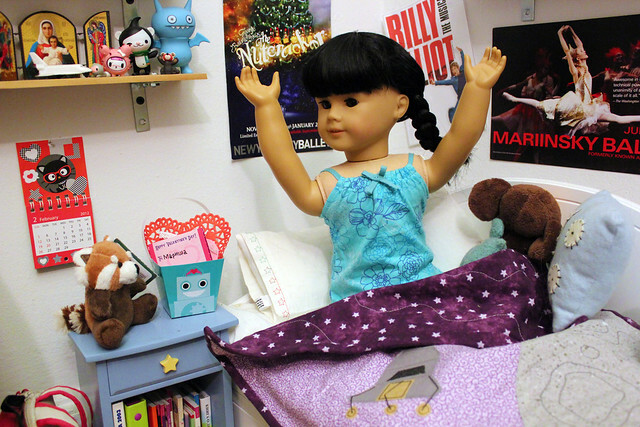 Okay so of course I have another question: where do you think I could find some headbands for dolls?? Yup, I'll post soon! I'm just a bit behind on photoshopping photos. Thank you for the compliment on my polichinelle costume! Awesome!! Thanks so much!! By the way, I love the SAB shirt, did you make that one? Yup, I made the iron-on. The tee is from Dynamite Threads though. Piper is wearing Nellie's PJs. They're an American Girl item from 2004. They're retired now, but they're pretty easy to find on eBay. Good luck! I'm glad your dad likes red pandas too- they're my favorite animals, ever! I heard you got an Ice Bat- isn't he the best Uglydoll ever? Hi Inky!!! I love your blog! 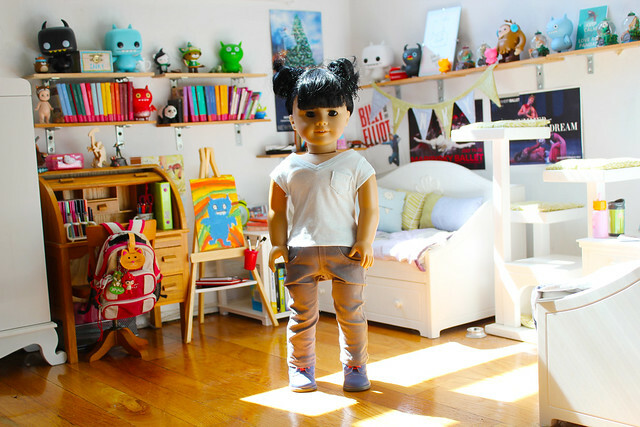 I also absolutely adore your bedroom! 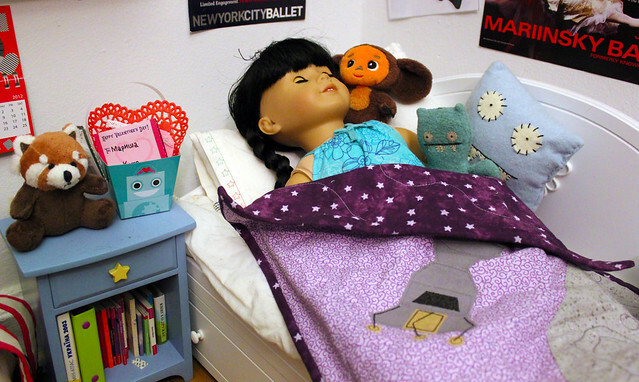 It's so detailed and cute, it looks comfy! :) Where did you get the uglydolls? I love Ice Bat and red pandas just like you! Look forward to reading your future posts! Thank you Zoey! I get my Uglydolls at Toy Tokyo, FAO Schwarz, and Lee's Art Shop. If you don't live in NYC, you can probably find them most easily at Toys R Us. Hiya!! I love uglydolls and red and giant pandas! hope you had a awesome valentines day! Heeyy! love your blog inky! can't wait for your next post! Aloha! I love your bedroom Inky! I love yours and Piper's creativity! I can't wait for your next post! Ciao Inky! 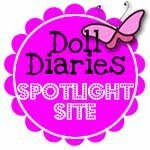 I'm new to your site and so far I'm loving every bit of it! You remind me of my friend Megan! Hi Anonymous! I still have valentines left and I'm happy to mail one to the UK. Just e-mail me at inkymarina@gmail.com with your address and I'll get one out to you!